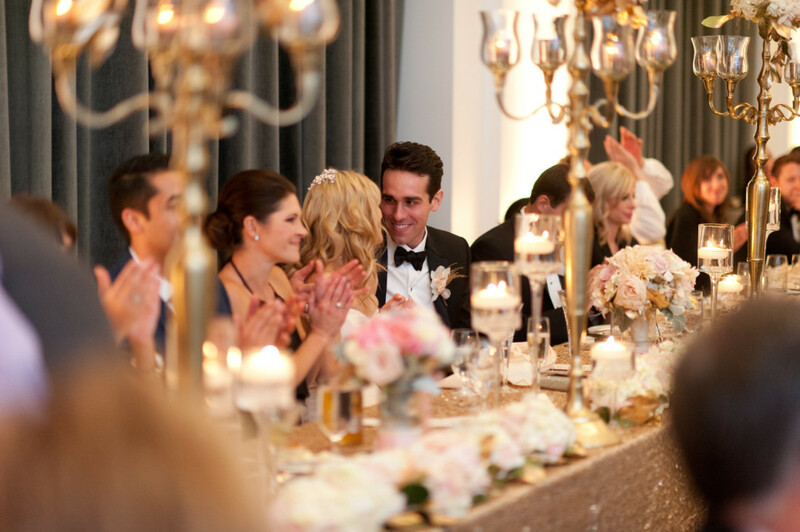 When a couple has impeccable taste, their wedding will no doubt be a glamorous affair. 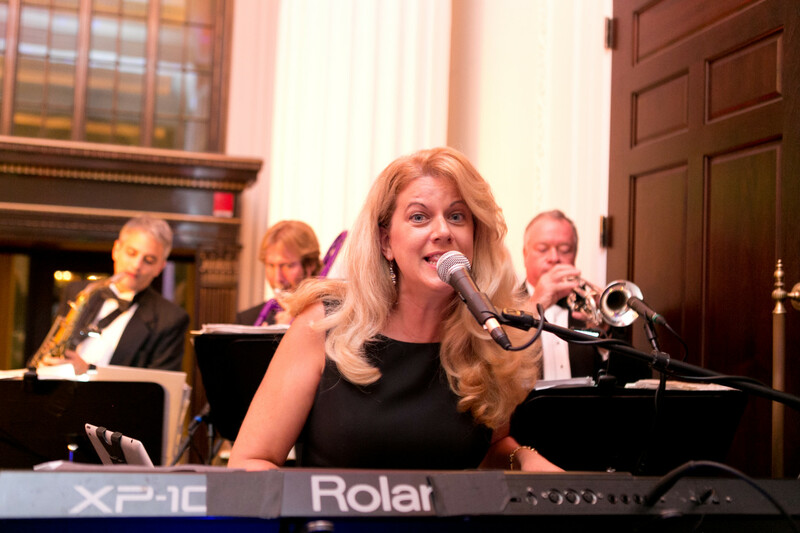 Laura and Louis had an amazing eye for detail and ear for music at their wedding at the Hotel Monaco. Their reception featured gold sequin tables, tall floral centerpieces, and a tasty dessert table. Top wedding band, John Parker Band, was there to get the party started, and got all their guests fired up on the dance floor. 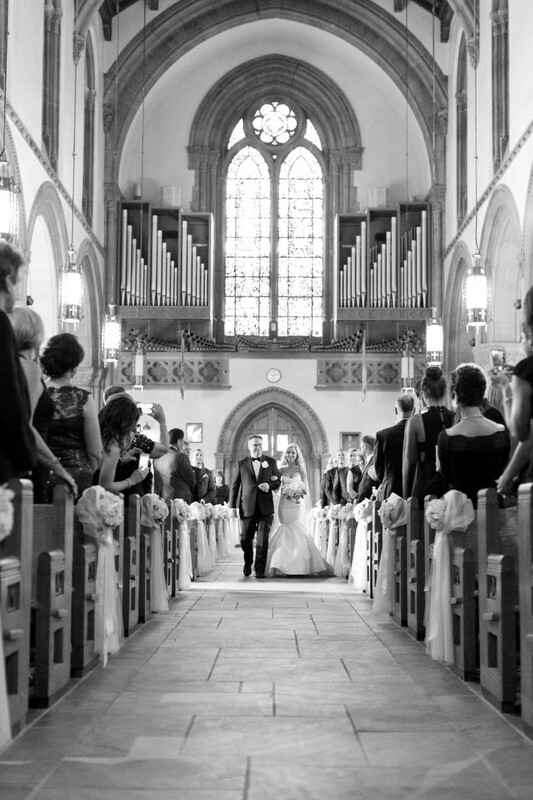 The ceremony took place at the stunning Saint Bernards, a huge cathedral church. Vows were exchanged in front of a large golden altar with an organ and pillar candles. The wooden pews were decorated with flowers and white sashes. We just adore this couple! So happy and in love, their joy was captured in this gorgeous photo, taken by Joey Kennedy. 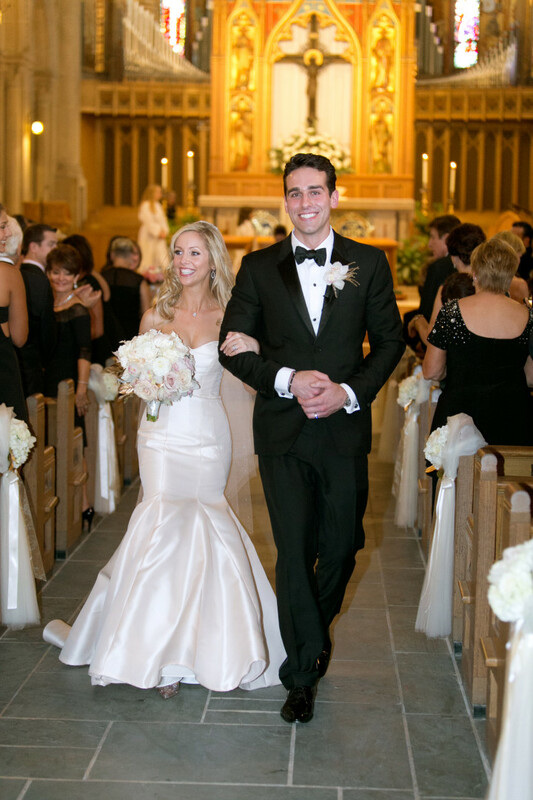 Louis looked sharp in his classy black tuxedo and Laura’s white satin dress, long veil, and diamond jewelry made her the perfect bride. 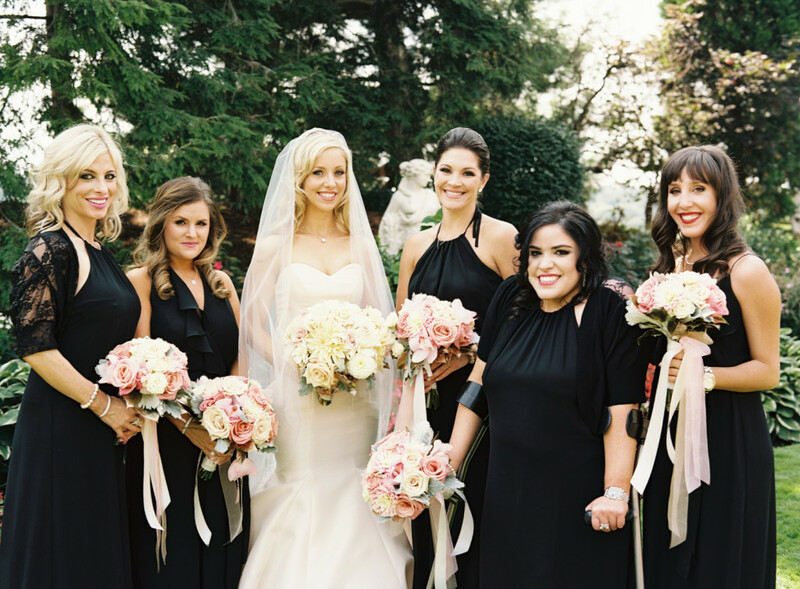 Her bridal court wore black dresses and we love that they are not all wearing the same dress! 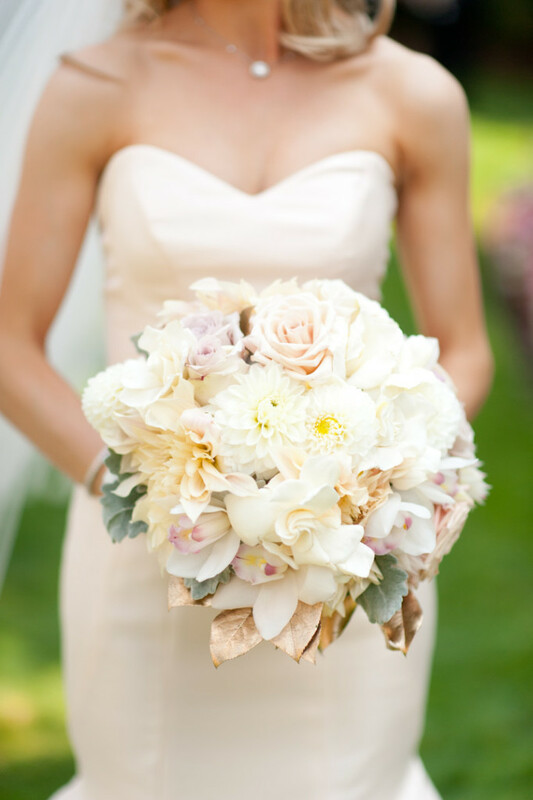 The bride’s bouquet featured roses, dahlias, and orchids. 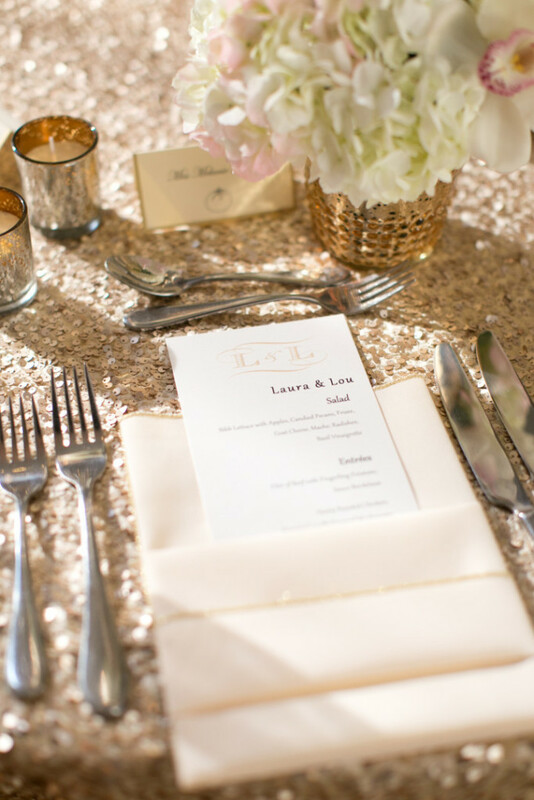 Leaves were spray painted gold, tying in the color scheme of their reception effortlessly. The same flowers were used to make up the floral centerpieces in the ballroom, done by Mt Lebanon Florist. 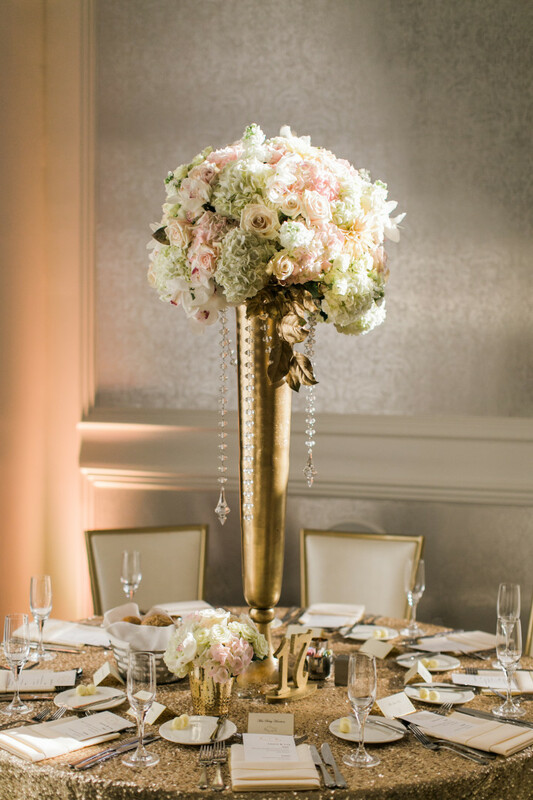 Each vase was gold and had crystal beads hanging down, just the right touch of sparkle. At each place setting, guests found a personalized menu with the monogram of the bride and groom. The sequin table cloths glittered and shined and the silverware gleamed. 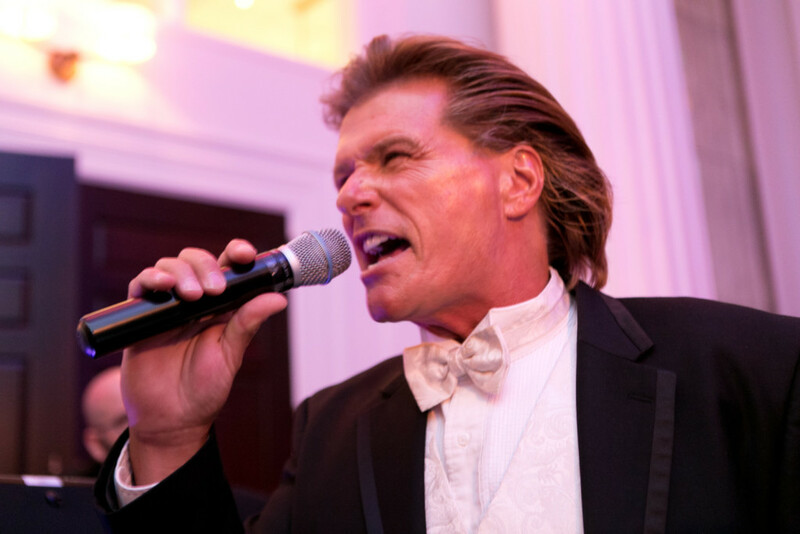 The John Parker Band welcomed guests into the ballroom and announced the bridal court and bride and groom. Before guests made their way to their tables, the band asked everyone to surround the bride and groom on the dance floor. 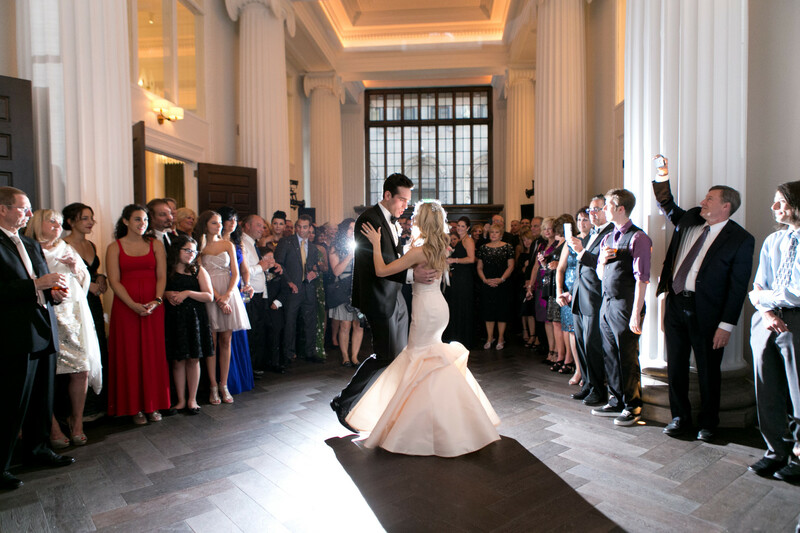 The band played “Can’t Take My Eyes Off of You” for their very first dance as husband and wife. Then it was time for their first course, followed by toasts from the maid of honor and best man. As dinner came to an end, John Parker Band began to play My Cherie Amour as the bride and groom cut the cake. What an amazing cake! 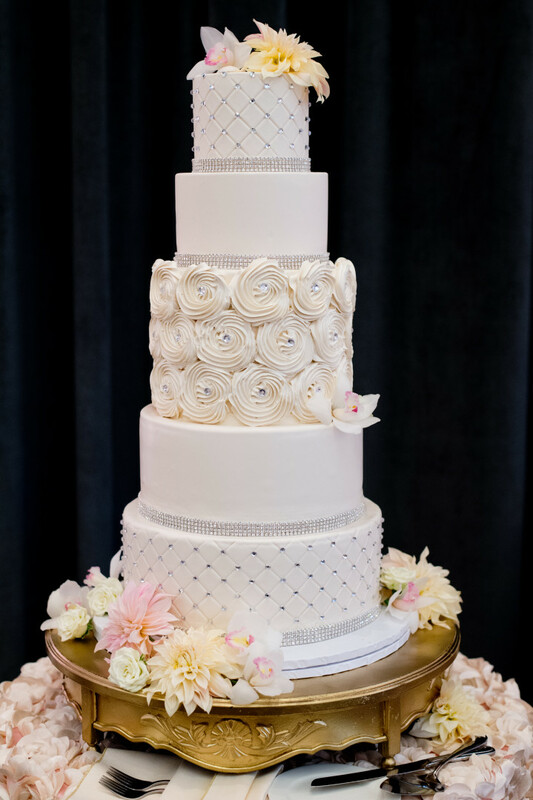 It was five tiers tall, with the middle tier featuring a rose swirl and diamond borders. The cake was truly a work of art! Bella Christies, their baker, is incredibly talented. 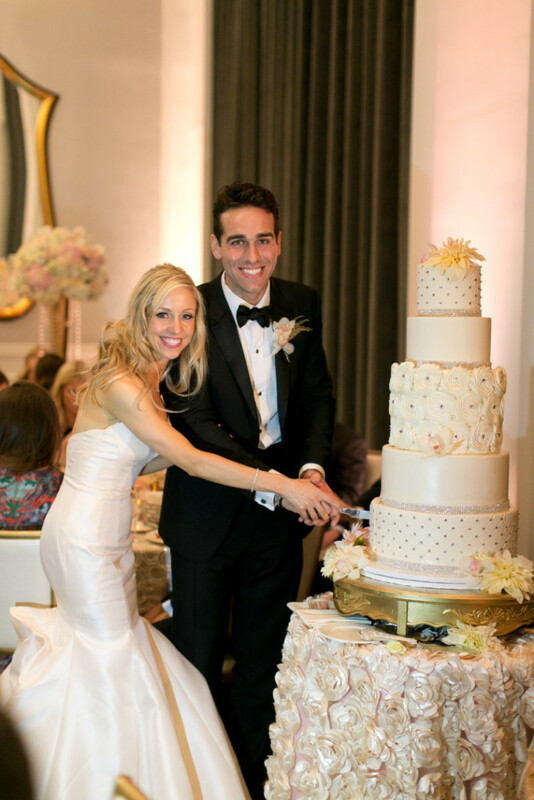 We also love the rose table cloth and golden cake stand. So glam! After cake was served, it was time to get the party started! The band played the upbeat Tom Jones classic “It’s Not Unusual” for the mother and the groom to dance a choreographed routine that brought down the house. John Parker Band played energetic, top hits, including some favorite oldies. 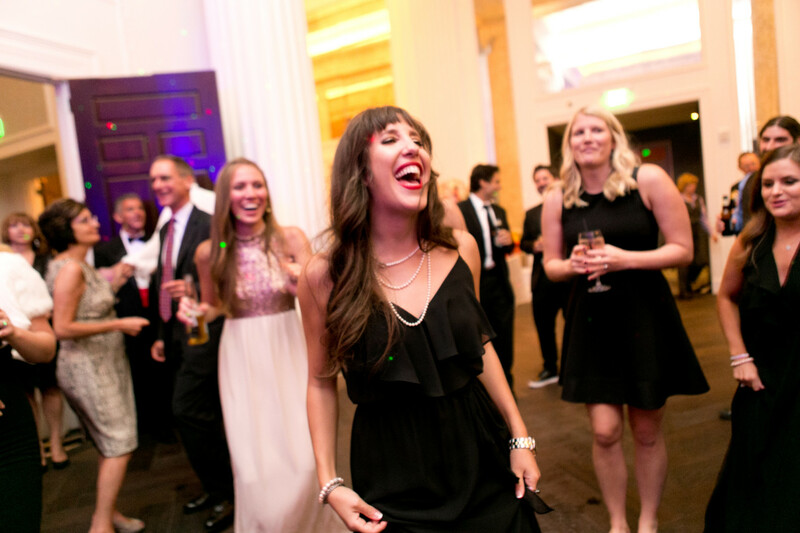 Friends and family swarmed on the dance floor, letting loose and feeling the fun, upbeat music. The party was so much fun that the band was asked to stay for an extra hour. 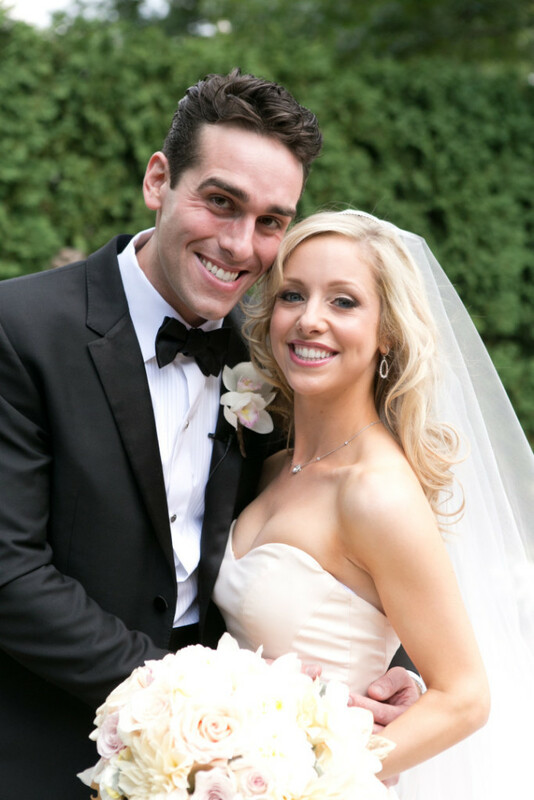 We are so thrilled to have been able to share photos from Laura and Louis’ wedding! Joey Kennedy did a wonderful job photographing their wedding and we can not thank him enough for sharing his photos with us. John Parker Band had a fabulous time celebrating with the newlywed couple and would love to play at your upcoming event! Don’t hesitate to contact the band today to discuss any questions or concerns you may have! We would love to be a part of your celebration! And for more amazing vendors, be sure to check out the list below of all the talented individuals Laura and Louis hired for their wedding.